What game did you play most in October? First Essen Game in: Spyrium! Yeah. This is totally worth nothing. Numbers are down, but I went to Spiel! So I don't care. Another D-Day Dice evening; always nice. This time including the Germans. That didn't go too well for me. Two full gamedays this month; playing a batch of great (new) games. But that's about it for October. Spiel, a few great days, hm. Good month, after all. New Game of the Month: Pfoe. Not Aquileia. It was good, but not that interesting. 1989 Was very cool, but I need to play that some more. Spyrium was nice, but needs play with more players. Sooo... 1989. 1x Survive: Escape from Atlantis! 18 plays of 11 unique games. Funnily enough, five days to go in October and Revolver was still "leading" the race, though it never had a shot at dethroning Raw Deal. Status quo between the two has lasted for soon 2 years (ever since I got Revolver which has seen a play per day every day). While waiting for my F4 Legendary expansion to arrive (come on, get here already), had to play something to get my DBG fix and luckily, have two other games from that genre to fill the void. With RE, was tempted to actually just hit all 28 plays of its rotation (56 characters, 2 used per play) in one month, but got sidetracked, by other games. Talisman continues to chug along, though looks like it will be beaten by Thunderstone as the next game to pass the 200 plays milestone, TS only 10 games to go, with five a month average, barring something mysterious, should get there before 2014. Couple of dust offs too this month, DQ not quite getting the plays I was hoping to get out of it (six or nine was the initial plan), but that likely means it'll get plays in November. DQ characters making a return home after their Runebound and Descent 2 excursions. Gears of War got back to the floor on the back of finally getting GoW Judgment and quite a few threads talking about the game on BGG, that always raises interest, so ran through the two POD missions with my friend. Not a high number of plays, but 3 gamings sessions per week, that's ok. The first new games from Essen arrived yesterday, so didn't try many yet. Look! Shiny! New! Games! Spiel! Plus some old stuff. The fact that I'm not listing Keltis: Das Würfelspiel as my most-played game feels like an achievement. Of course, since there's a tie I could choose it, but I'll choose something else instead. 48 plays of 30 different games. New to me in bold. Hi! I'm Macaos. A cute, kind, sporty and fun Bearded Collie. I enjoy lying under the table when Macao is on the table. Great month for gaming! And next month is going to be even better with 2 cons. 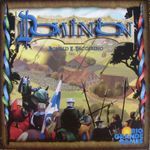 One locally and BGG.con. 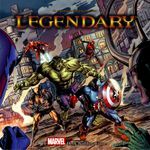 All new games was ok or better, except for Asgard's Chosen. I don't think I'll ever play that one again; it was no fun. New Game of the Month: Both Lancaster and Trains were very good games. 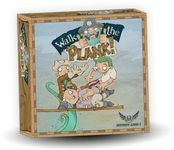 New Games in the Collection: Walk the Plank! 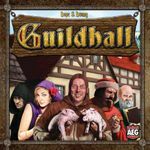 Our newest game, Guildhall, not only saw the most plays this month but surpassed Pandemic for our most played game of 2013 thus far! 61 plays across 11 games. 25 plays across 16 games. Pretty lacklustre month for getting together with people - a lot of my regular gaming friends were out of town for a good portion of the month. I had a fair bit on my plate too, and didn't do as much solo gaming as I expected. As such, Friday was not my most played, as predicted. Hanabi won that race, and I had just as much fun playing it with new players as I did a couple of 2 player games. I quite like how the communication and strategy changes with two - we spent a lot of time giving clues for single discards, just to pad out the action and cycle through the deck. 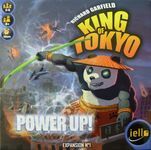 I started playing on BGA this month, but have decided just to log F2F games. 1 Hey, That's My Fish! My prediction for next month is Walk the Plank! 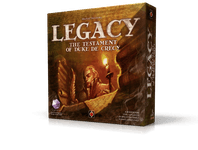 - I've only played it a few times thus far, but it seems like one that people will pick up quickly and be up for multiple games of. 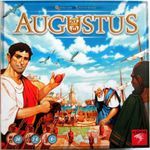 October is a peculiar month: Spiel is coming, and I usually spend some time (waiting for new releases) playing games I like or simply games played once and then forgotten. Three new Essen games: Pentos (a rather convoluted rummy variant in a lovely small box), The Rats in the Walls (a simplified Perudo variant with an Horror setting), American Rails (a slower, longer and somehow calmer version of Chicago Express). I only log F2F games. Bolded games were new to me. Games in Red had been gathering dust on my shelf for more than 12 months. 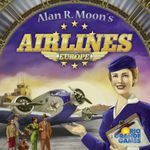 118 plays for me in October - a very good gaming month, especially the last part with the Essen fair. I didn't get to play much during the fair itself (as I was working), but in the evenings I got some plays in. Plenty of new stuff, too. Mölkky was outside the scope; I played a number of matches during the fair, for demoing purposes. I like the game quite a bit, but couldn't carry back a copy. Plus, winter is coming, and I wouldn't be able to play it again before spring. I picked Machi Koro for my entry because it might be the only play I will ever record of this, unless it becomes widely available around here one day. 4 x EinStein würfelt nicht! 1 x Go Away Monster! Not much suprise that this small filler game got the most plays. Everyone in my gaming circle seems to like it, because it's quick, fun and good looking. 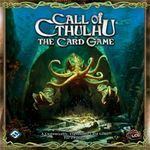 Certainly it will get a lot more playing, since I will introduce it to my no-regular gaming friends and my standard gaming group also ask for it regularly. I enjoy Libertalia very much, especially short term tactical planning - what your opponents will do and when, and planning my moves accordingly. I'll try to make sure Libertalia gets on the table at least once in a month. This game really gets better with more plays. At first I wasn't so impressed as everyone seems to be. But developing strategies and learning cards make the game much better. The main minus - it can be quite long, so hard to fit Twilight Struggle into workday night. Two fun 2 player games of Infiltration last month and first time the prototype was carried out. This doesn't get much plays, because I don't own the copy of game and borrow it time after time. The game is a great implementation of TV series and creates a backstabby/intrigue atmosphere of ancient Rome, and of course great gladiator fights. 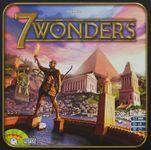 I think it is one of the most underrated games in BoardGameGeek, As I've written before - it has everything a true gamer needs: great theme, decent mechanics, interaction between players, quite easy to learn and feeling of tense. We're really enjoying Bruges for how many interesting things it has going on in a 30-45 minute game (with 2-3 players respectively). The fall is a fairly busy time for us. We have a lot of events with the youth since it's the start of the school year, and also a number of church events we participate in. As a result gaming time seems a little more scarce. Luckily my birthday is also in October, so I can usually guilt my family into at least making a few days to sit down and play games with me to celebrate. As a result most of these plays are wrapped up in only 3 nights of gaming, so 20 plays is actually pretty good considering. Most played is actually one of the games I received as a birthday gift. I like it, and hope to play it a lot more with my family. 37 plays of 11 games with Love Letter being by far the most played. Bold indicates a new game to me. Red indicates a game not played in at least one year. Face to Face plays only. The big title this month was Through the Desert. I've been playing the game since 2009 (and I've owned it since 2010), but it's never hit the big time at #1 until this month. It's gotten many 2-player sessions in as lunchtime games at work. I've barely played this 2-player beforehand, but it really works. The tension stays high, the decisions remain difficult, and it flies by quickly - we're comfortably able to fit three plays in, including setup, in a lunch hour. No new lifetime quarters this month, but I did hit another milestone: my 200th play of Bali! This time-tested word game hit the table 100 times for me in 2010 alone, but the count has gone down considerably since. Nearly all of the plays have been against my wife, who is a vicious word thief - do not let your CHEW stay out for more than a turn, because she WILL turn it into ESCHEW without a moment's hesitation. 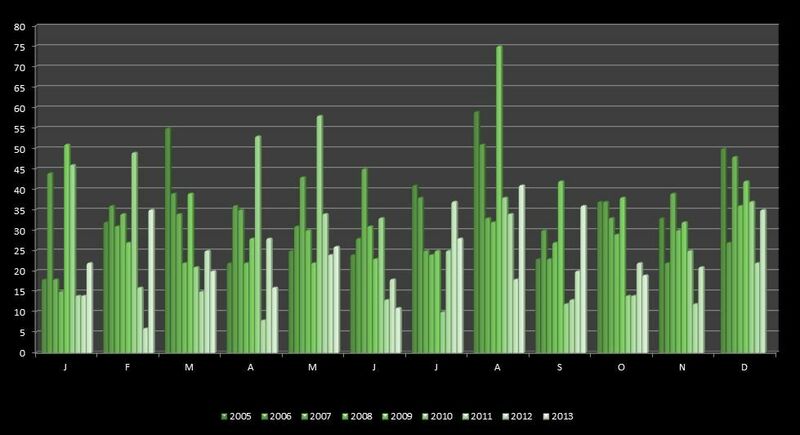 Sadly, besides last month, this was my worst month since May 2009, with lunchtime games at work becoming rarer and rarer. Quills - NEW - Well-designed word game, with bits of Prolix, Quiddler, and Bananagrams combined into an intriguing package. This month I played 11 games. Only one was repeated. October was the first month in a long time that Crib was not mymost played game. This was due to the fact taht I was too busy to get to my 'older' friend's house to play. Hopefully that changes now in Novemeber. My customary most-played games from recent months, at usual rates. Slipped into the top three, partly by virtue of solo playability. I don't expect it to stay in my top three, but it will certainly continue to see play. This game is good fun. Bumped from the top three. I sure would have liked a bit more Summoner Wars for Orctober. The only Looney Pyramids play at our house this month. Another game I would like to have played a bit more. This one is pretty much played out. Can it be? Only one play? And finally, some diverse Yog-Sothothery for the Hallowmas season. Ok, so Hollywood was actually my second-most played game. But I still chose it as the main title because it's new and unknown, while the actual #1 is known to everyone (and hated by the majority, haha). Hollywood was an Essen purchase that is a huge hit with my family. It's a simple drafting game with an auction round as a bonus, and you try to collect sets of cards that can be "movies" (every movie needs one script, one director, one or two actors/actresses and any number of special cards that include stuntmen, composers, sound engineers and a whole lot of others). I played 60 games last month, which is a record. You can find my opinion on the new-to-me games in this GeekList entry. October was a quality vs. quantity month - a few solid play sessions with friends of some favorite games and exploring new ones. Meanwhile I kept busy in various Yucata tournaments online. With a three-way tie at the top, I'm going to give the nod this month to Hanabi. It's always great to see a game you teach to new players go over well enough that they immediately want to play it again. Everyone appreciated the challenge, but didn't mind it being such a light game. It's one I suspect we'll play fairly often - but probably not as much as Love Letter! Here were my face-to-face games for the month. Bold = new to me. And here are my online totals - mostly from Yucata. A great month for new games as well as for playing games! The trend continues with this game, made better with the expansion! 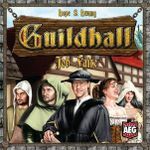 Fast and fun game IF played with the right group. 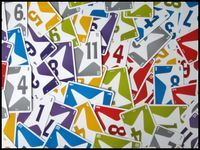 The game can drag with defensive play, which may necessitate some house rules or removal of defensive cards, or better yet do not play this game with such a group. Has been received well by all the groups I have introduced this to! A more tactical and more chaotic cousin to Glory to Rome! Simplified and streamlined version of Pandemic without reduction of the difficulty level! Good alternative deduction game to The Resistance: Avalon. 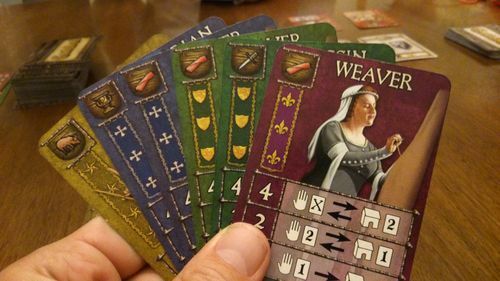 With the Agricola: World Championship Deck – 2011. 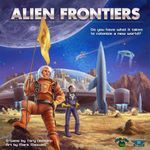 Nice flicking 4x space game! 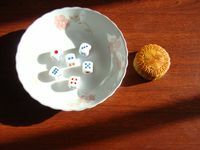 A traditional dice game best played only annually! Played in the last hours of October! October 2013 saw me have 57 plays of 27 different games. Very light month of gaming for me this October. 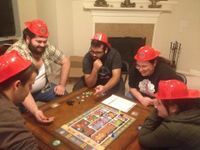 I've been busy with the new job and too busy organizing a local con next month to attend a weekly game club meeting. Why Backgammon? I play it sometimes at the gym when I do some cardio against the AI. It's pretty lame, so not much challenge.